Since bits and pieces of plot information, villains and even the revelation of Iron Patriot armor have made their way online, we've been well aware that Iron Man 3 has been shooting since last month. However, today Marvel Studios has decided to officially announce the commencement of production along with a first look photo from the set featuring Robert Downey Jr. in his lab, and his expanded set of Iron Man armor, including the Mark 7 suit from The Avengers. It's a simple shot to get the fans excited, and hopefully we'll get some official word on the plot of the sequel from Shane Black headed to theaters next summer. Look! Iron Man 3 is directed by Shane Black (Kiss Kiss Bang Bang) from a script he also wrote with British TV writer Drew Pearce ("No Heroics"). Robert Downey Jr. returns as Tony Stark along with Gwyneth Paltrow, Don Cheadle and Jon Favreau reprising their franchise roles from the first two films. New cast members include Ben Kingsley, Guy Pearce, Rebecca Hall, James Badge Dale and Ashley Hamilton. Story details are unknown at this time but stay tuned. Disney sends Iron Man 3 to theaters next summer on May 3rd, 2013. How did he get the armor from his first build to put on display? Didn't he leave that suit in pieces in the desert after he escaped from the cave? If you remember, in 'Iron Man', Obidiah Stane (Jeff Bridges) aquires the remnants of the Mk1 Armour from Raza (Faran Tahir) who collected them from the desert where Stark crashed. Stanes guys then used the Mk1 remnants to reverse engineer the 'IronMonger' armour. Thank you. One would have to assume either Obediah Stane took it from the bad guy he killed after meeting with him, or Tony re-created one to fill out his museum, since he would never need to wear it again. Like a soap opera, laws of logic don't always apply to a superhero universe. I love the idea that Tony Stark is OCD enough to recreate an entire suit of army for aesthetic reasons. I think that fits his character well. He realized that the only person who had the equipment to remove the suit was Tony Stark? How, in the first place, Rodey took it from the gallery? Is it not made for Tony Stark size only? And is not the ARC reactor of Tony the starter key of the suit? How was even able to take it off? Don't get me wrong, I'm not bitching for the sake of it, it's just a detail, and it's fun to point it out. Yeah, but if we starting to try to decipher Avengers little-details too, it's going to be a lot of work. I lost the part (or the details) about the re-sized armor for Rhodey. 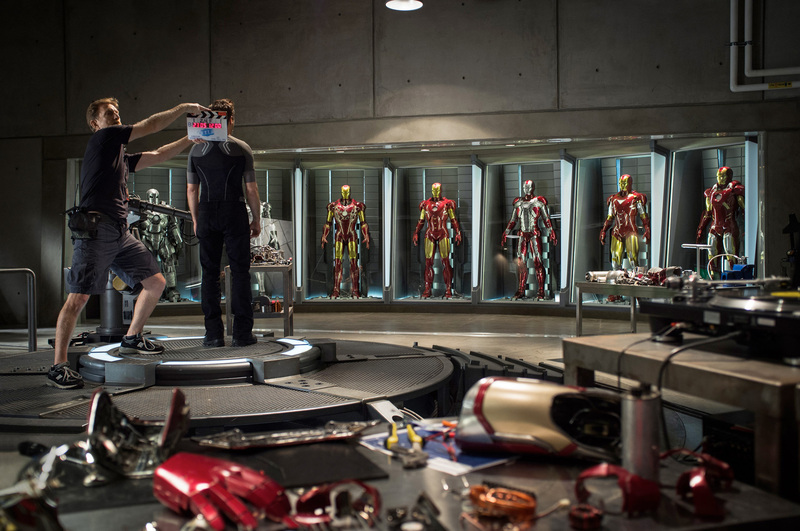 I thought there were just one arc reactor to fuel the suits, and it was in Tony's chest (IM2). Don't forget the man's a genius. He probably has every piece of it memorized. I'm bugged less by the fact that he has the Mark I armor, and more by the fact that it seems disproportionately small. I mean, that was a big honkin' suit, not nearly form fitting like the later models. It should be at least about 25% bigger than the rest. Are you talking about the Iron Monger or the Mark I suit? No, I mean the Mk. I. Monger was enormous, like 3-4 times the size of normal armor (not to mention not one of Stark's designs). Mk. I was bigger than the rest of the suits still, but not quite to that scale. I see your point. The scale of the MK I it's not right and the MK II was borrowed by Rodey and modified by Justin Hammer, so... the one there, for sure, it's a cardboard picture. Mark III and IV look vastly different than I remember them. Maybe I'm wrong, but it definitely seems off. Also, as everyone has said, how did the Mark II get back? Wasn't it modified into the War Machine armor or was the War Machine just built using the specs from Mark II? WAIT I TAKE THAT BACK, if you take a closer look, you see its just a wire frame and no actual suit there. Is it just me or shouldn't the MK VI have metallic colored upper thighs? Look concerning Mark I, Tony probably got the spare parts that were seen hanging in the arc station IM1, as for Mark II, Tony could have very well rebuilt it(from the Mark II secret project file that he created in IM1) to fill up the emptied space in his gallery, or Rhodey could've have had given it back and Tony converted it back to normal(Which I highly doubt, but still possible) This picture is really cool, It will be cool to get a pic from the cars too to see what new rides Tony had added to his collection and how they look. Highly looking foward to this film. And hopefully this film has an awesome score like the one Ramin Djawadi composed for the first movie, because the score from the second movie was wasn't good, no offense. Why would they take such an inexperienced director to helm one of the most godly movie trilogies? Why don't you ask Joss Whedon?